Codonoboea in its current wider sense is the largest genus of dicotyledonous herbs in Peninsular Malaysia with about 80 named species. Botanical exploration of poorly known areas continues to discover new Codonoboea species on a regular basis. Codonoboea is confined to primary forest where it is ubiquitous from the lowlands to the highlands occurring on granite, sandstone and in quartz-derived soils or rocks, but it is noticeably absent from limestone and aquatic habitats. It is diverse in regard to habit (although there are no climbing or epiphytic species), leaf and flower morphology. Its centre of diversity is Peninsular Malaysia, but species are also found in S. Thailand, Sumatra, Singapore, Borneo, Palawan (the Philippines), Sulawesi and New Guinea. This genus has had a tortured taxonomic history. Originally described by Ridley in 1923, it was at first restricted to only three species. However, Codonoboea was ill-defined and eventually (after several intermediate stages), was reduced to a section within Didymocarpus. 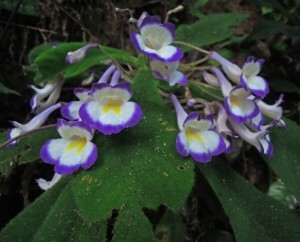 When Didymocarpus itself underwent redefinition, a number of what are now Codonoboea species were transferred to Henckelia, with clusters of species in India, Sri Lanka and in Peninsular Malaysia. Recent molecular analyses now show conclusively that the Indian and Sri Lankan Henckelia species are distinct from the Peninsular Malaysian species and among the Peninsular Malaysian species, Loxocarpus species are also distinct from both Henckelia and other morphologically similar genera. These non-Henckelia and non-Loxocarpus species are now accommodated in the genus Codonoboea that is the remaining validly published name for this group of species, and the generic circumscription has been enlarged to accommodate them.